"We're gonna start with a tiny little half-song," said José Miguel Contreras of By Divine Right, a band that's been up and at it for about 25 years now, going through many member iterations over the years. The current line-up of Contreras, bassist Alysha Haugen (Sheezer) and drummer Geordie Dynes (The Mark Inside) brought their bright tunes to the BOFF stage Sunday afternoon (September 18). 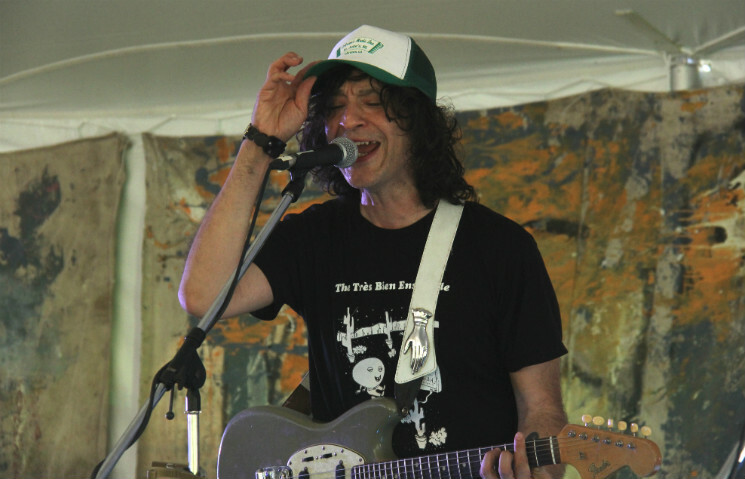 Contreras seemed to be in the finest of spirits as he wiggled his way through their set, adjusting his baseball cap over and over, sporting a smile all the while. He really gets into it when he plays, almost massaging every note out of his guitar, bending his body as he bends the strings, grinning when the going gets good, mouth open wide when he hits his stride. Keeping it calm and collected as always was Haugen, the only band member wearing sunglasses, who looked effortlessly cool, if not a little disinterested. It's all fine and dandy, though, as Contreras had enthusiasm for days. By Divine Right's set was one of the most family-friendly of the fest, with a number of children running around in front of the stage, including one boy that was quite invested in not one, but two balloons. Contreras had only one thing to say: "Wicked." Nearly every song opened with an anecdote from Contreras. Before "The Hill," he noted that "This song is about living in the country, I could look down and see you guys," while "Mutant Message" found him admitting "I sincerely wish I wrote more songs abut space aliens…I guess all my songs are about space aliens." Their cover of Depeche Mode's "Photogenic," from their 2016 release of Depeche Mode covers Speak and Spell US, was a bit of a marvel, that synth riff translating so well and much heavier than one would think. "Thanks mum, for creating my body, one cell at a time," said Contreras, adding to the friendly, family feel of the set. By Divine Right Set Release for Depeche Mode Covers LP, Share "Nodisco!"